I love rainy days even if it is on a Saturday. We ate a late breakfast and decided to head down to the shops at Maple Grove. Chris wanted to get a few things and since there was nothing else going on we just walked around to other shops and browsed. Michelle and Jake had nothing pressing too, and they came along. After we were done shopping I started getting a hunger pain. My family always picks on me as I like to eat the same time each day. Its like clock work and I do not wear a watch. Anyways, I suggested we try a local wine bar in Osseo. Chris liked the idea so we headed there. To our surprise, the wine bar opens at 4:00pm Tuesday through Saturday. It was 2:30pm and I was not willing to wait so we headed home. Chris had me grab the menu and I read it on the way home. 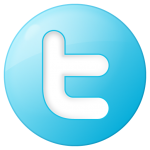 The food sounds really awesome so we will be heading there in the very near future. Reading the menu Chris decided she was going to make some Crustini’s with Brie and Chiptole sauce with an artichoke dip. Now that we have decided on the mid afternoon appetizer we needed something to wash it down. I wandered down to the cellar and I immediately knew what I wanted. 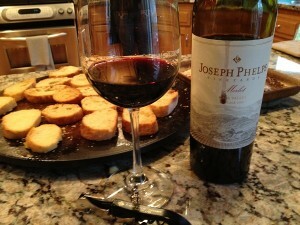 It was cold and rainy so why not a Joseph Phelps Merlot. 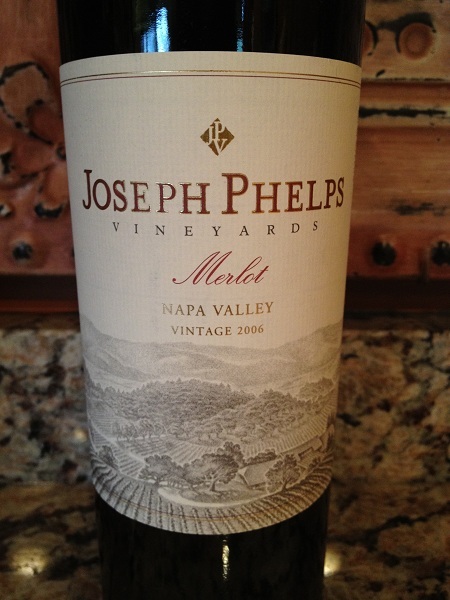 Joseph Phelps does not offer their Merlot every year. 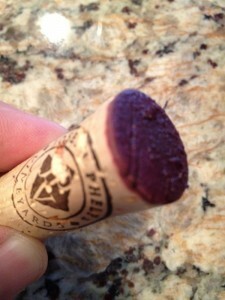 It all depends on what they need to blend with the Insignia or the Cabernet Sauvignon. Last year they did not need very much Merlot to blend so they offered it at the winery. When we heard about it we immediately bought a case. As soon as I brought the bottle up Chris hummed. The bottle brings us back to last June when we spent the day at Phelps. I had to bring Chris to the airport later that day and she missed her flight. Needless to say she was not heart-broken. It was time to pull the cork and pour us a glass. 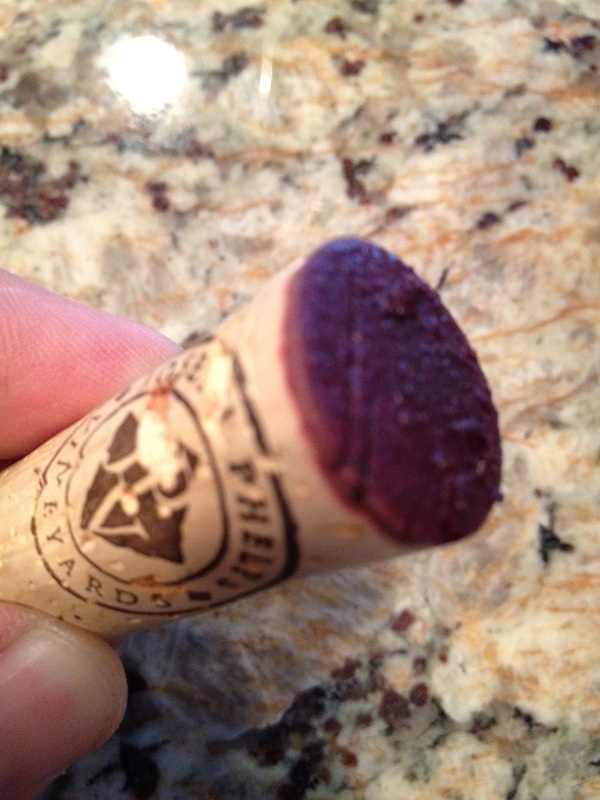 As soon as I pulled the cork I noticed sediment on the cork. 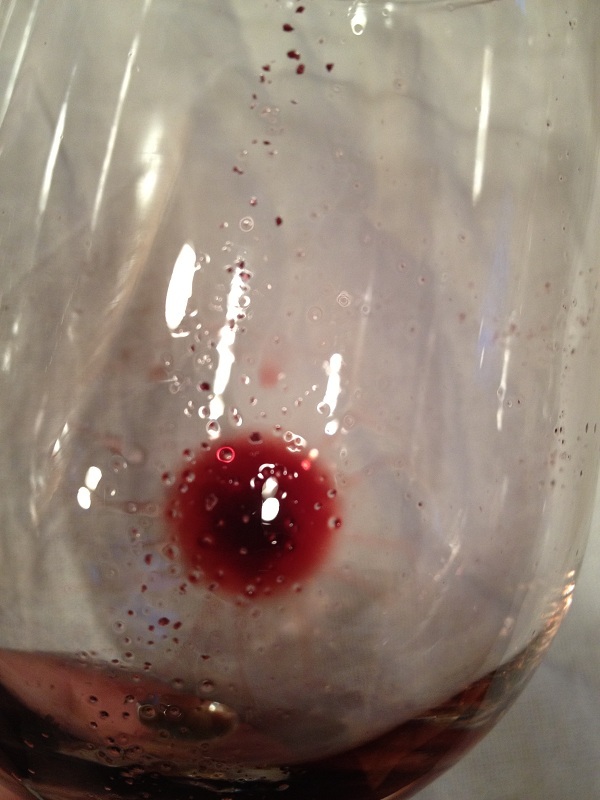 In the past I have either used a decanter to remove the excess sediment or pour the wine into the glass very carefully watching the neck with a light. I poured us both a glass of Merlot. Examining the glass the Merlot’s color depth was deep not thin or opaque. The hue was a very nice purple and the wine was clear through out. It was time give the Merlot a try. Smelling the wine the aroma was not very intense. It was very aromatic. The Merlot was very youthful-fruity. 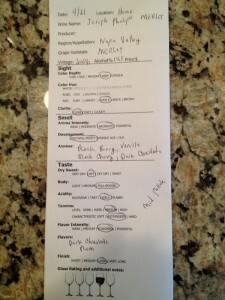 As far as aromas we detected Black Cherry, Black Berry, Dark Chocolate, and a hint of Vanilla. It was time to taste it. Tasting the Merlot the tannin’s were very soft to a little dry and filled my mid palate. 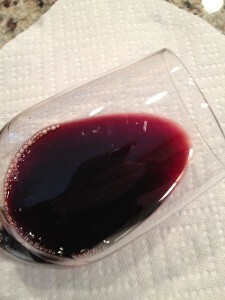 The Merlot was very full-bodied and lively. The Merlot was very flavorful. Some of the flavors were Black Cherry and maybe a little Anise? The finish was long and very nice. 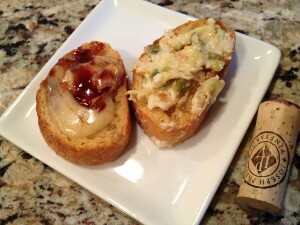 Paring the Merlot with the crustini’s were amazing! Every time Joseph Phelps offers a Merlot we will be buying at least a case. 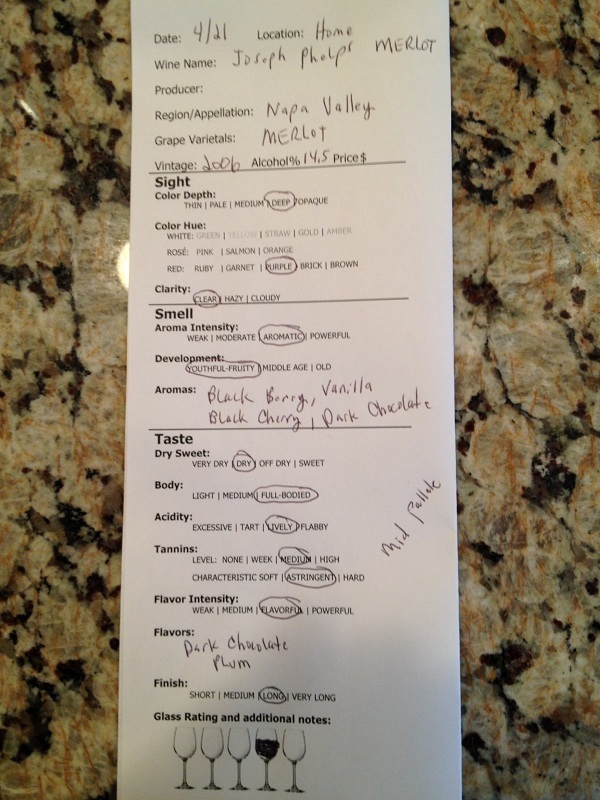 We both rated the 2006 Merlot four glasses. 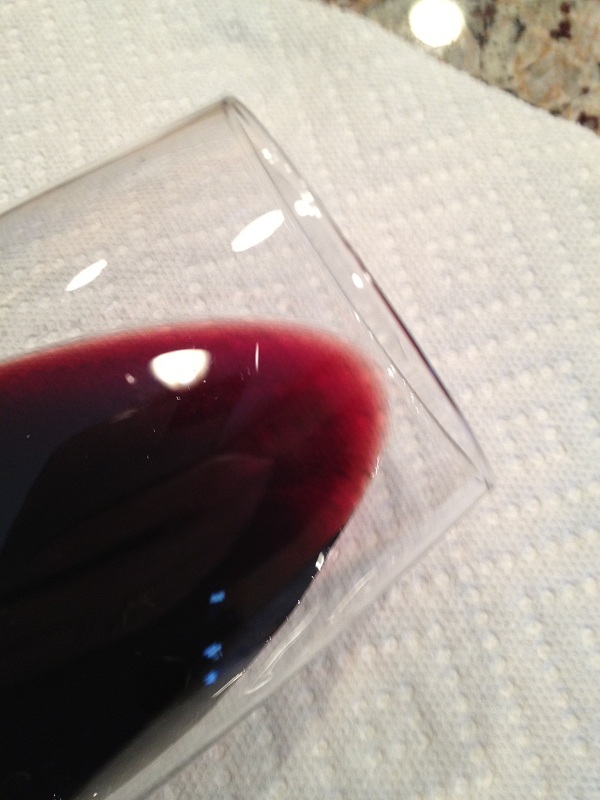 Oh yes, even though I was careful pouring the 2006 Merlot there was still sediment in the glass.